Canada Permanent Trust, North Vancouver hires Brian McCullough. One month later, Brian sells his first home. Stock markets crash in North America. Mortgage rates hit 21%. Brian continues to grow his real estate business and is ranked in top 5 % of realtors for his office sales achievements. (March) Brian is awarded Production Leader of the Month in British Columbia by Realty World. Brian is awarded #1 Listing Realtor and also #1 Sales Realtor for Northern Lights Real Estate Board, after only a short time in the business. Brian is elected President of the Northern Lights Real Estate Board. Brian is elected as a director of the British Columbia Real Estate Association. Brian is again awarded for top achievement for Northern Lights Real Estate Board. Touché Ross Limited selects Brian after interviewing 26 National companies, to help liquidate the commercial assets of Pioneer Trust Company who has many shopping malls within its portfolio. Brian, after reading the book “The New Entrepreneurs” calls all of the wealthiest people in Canada in this book to sell Pioneer Trusts Assets. Brian successfully sells the largest of its Northern B.C. shopping Centre’s the same year and is again awarded Top sales for Real Estate Board. Brian is awarded #1 Realtor for Northern Lights Real Estate Board for total sales volume. Brian decides to relocate his family to Vancouver Island. He joins Coast Realty in Nanaimo as their 14th Realtor a company formed by 6 Realtors wanting to break free from franchise restrictions in order to establish an independent company that remains to this day, committed to ” People above All “. The City of Nanaimo begins to revitalize the downtown area with construction of a waterfront promenade. Brian establishes a marketing strategy to market sub dividable properties in Nanaimo. He successfully markets 72 residential lot sales in Cathers Landing that year through 1990. This development serves as the catalyst for neighborhood development in the Jingle Pot area of Nanaimo. All this done without an assistant or even a computer! Brian is awarded #1 Realtor for Coast Realty in Nanaimo. Successfully sells out “Lakewood Village Estates” a large development of adult-oriented townhomes. Brian continues to balance new home construction with resale home sales. Nanaimo continues to expand with construction of multi-family waterfront condos downtown to connect to the promenade and boat harbour. Coast Realty Group begins its steady expansion from a single office to 15 real estate offices on Vancouver Island. Real Estate and stock markets in North America experiences major pull back. Brian continues to expand his commercial and residential sales and focuses on attracting new investors from out of town markets. Brian sells a rural shopping mall concept to an Alberta company and leases the project out to bring Cedar its first Shopping Mall. Brian is hired by Windley Contracting to market the only industrial centre project of it’s kind at the time where buyers own their buildings but lease the underlying land for 10 years with an option to buy at the end of the lease. Wellington Center is a great success..
Brian is hired to help design a concept and then market the industrial strata units at 1850 Northfield Road ” Northfield Center”. City of Nanaimo awards Brian “Industrial Design Award” for real estate excellence with development project design for 1850 Northfield Center and Coast Realty awards Brian for top sales achievement and is voted “Most professional Realtor” by his real estate peers. Brian is presented with top sales achievement award by Coast Realty. Brian is again presented with sales achievement award by Coast Realty and is voted “Most Professional Realtor” by his real estate peers. Brian is presented with sales achievement award and again voted as “Most Professional Realtor” by his real estate peers. 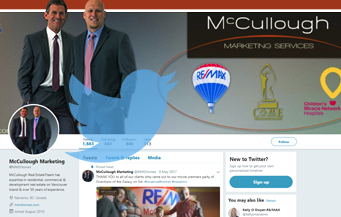 Myles McCullough joins Brian in marketing real estate and McCullough Marketing is formed to assist both the needs of residential buyers and sellers, as well as developers and residential builders wanting to sell multi-family real estate units. Brian is voted as “Most Professional Realtor” by his real estate peers. Myles personally averages 2.5 homes sold per month in his first year as a Realtor. Brian is awarded #1 Realtor for Coast Realty in Nanaimo with consistent top sales achievement and is voted “Most Professional Realtor” by his real estate peers. Coast Realty becomes the #1 largest independent real estate company for Vancouver Island and maintains 15 real estate offices on Vancouver Island from Ladysmith to Campbell River and Ucluelet to Powell River. Brian and Myles sell the “Old Rutherford Golf Course” to make way for a multi-phase single family / townhome development. Brian is awarded the Gold CARE Award by Canadian Home Builder’s Association for “Best Realtor on Vancouver Island for New Home Sales”. Brian remains the ONLY Realtor in Nanaimo to achieve this award for sales. Brian is also presented with top sales award by Coast Realty. McCullough Marketing completes over $26.5 million in real estate transactions in a single year. Brian cautions clients to heed some concerns about economic times changing and warns buyers not to buy “more than they can afford”. Brian celebrates 20 years working with Coast Realty Group now numbering over 300 professional realtors in the company. Economy is pushed into recession and real estate sales drop by over 50 % compared to year previous. McCullough Marketing has now completed over 800 sales and over $100 million in real estate sales. Nanaimo received the Top 25 Canada award in Trip Advisor’s 2008 Travelers’ Choice Destinations Award.Nanaimo also named as Cultural Capital of Canada, making it one of only 4 cities to be given this honor. Brian is again voted “Most Professional Realtor” by his real estate peers. Coast Realty expands their website to include all 15 office’s listings on one single website, serving the needs of anyone thinking of buying in Nanaimo and Vancouver Island. Brian and Myles sell out “The Montebello” a 27 unit condo development in central Nanaimo after original builder falls into foreclosure. The Montebello becomes the ONLY condo project to 100% sell out in 2009, and does so in only a few short months. Brian is again awarded the distinction of being the #1 top selling Realtor for all of Coast Realty. Myles is coming on fast and wraps up the year in top 20 Realtors for Coast Realty. Brian and Myles sell more lakefront homes in Nanaimo than any other single Realtor for previous 3 years in total. Myles personally averages 4.1 real estate sales transactions per month for the entire year. Brian & Myles / McCullough Marketing sells out 18 rancher subdivision in Uplands area offering main level entry homes ideal for empty nesters and home owners wanting to customize their next home. Brian is awarded #1 Realtor of the Year (based on sales achievements) for Coast Realty – setting a record for Coast Realty agents for years winning #1 Realtor Award as well as “Most Professional Realtor” as voted by his real estate peers. Brian & Myles McCullough sell out Amblewood Village Phase I – one of the only townhome/duplex developments to sell out that year. Brian & Myles sell out “Southridge Estates” a new development of family homes in Chase River. Brian is awarded marketing contract for “Pacifica” – a waterfront condo high rise in downtown core. Brian is named #1 Realtor for Coast Realty Nanaimo for Annual Sales Volume for 2011. Brian sells the land, negotiates approvals for re-zoning and development and is awarded the marketing contract for “Portsmouth Professional Centre” which will offer newly constructed commercial buildings for sale targeted for medical and professional use, and condos on the second level for individual sale that are set for construction in Spring 2013. Brian lists the 2nd phase of “WestRIDGE”, a development near Westwood Lake that Brian handled the acquisition of the acreage as well as redevelopment and subsequently marketing of the new homes. Brian is selected as the realtor to handle the sale of a 1614 Morey Rd, commercial building in central Nanaimo that is fully tenanted with a long-term lease. Brian also lists for sale a 20 pad mobile home park with shop and detached home in Cedar. Brian, after extensive building and subdivision approvals, starts marketing of one acre commercial lots in new development on Bowen Rd. in central Nanaimo. Brian handles the marketing of a freestanding building in “Wellington Centre” which is being offered for sale for $3,995,000. After dozens of great years with Coast Realty, McCullough Marketing moves offices to RE/MAX of Nanaimo.